Captain Joseph ARMSTRONG was born in Londonderry Ireland in 1711 of Scottish ancestry, Joseph Armstrong married Jennet Stewart in Ireland. Their first son, John, was born in Fivemile Town, Fermangah, Ireland. Their daughter, Mary Katherine Armstrong Currie is my line. Known children include Mary Katherine, John, Thomas, Joseph, James, Margaret & William. 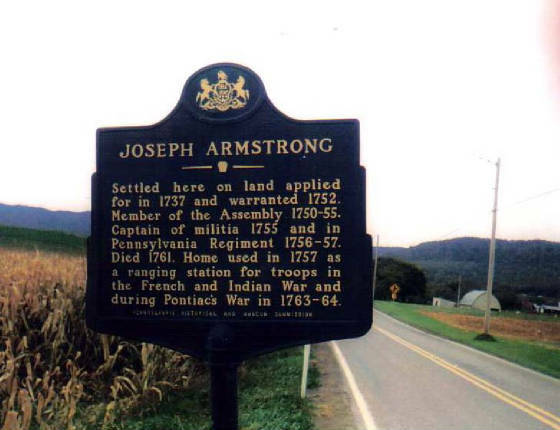 Joseph Armstrong and family came to Pennsylvania in 1731 according to passenger lists. Captain Joseph Armstrong was captain of the Militia and his son, Col. Joseph Armstrong was a Rev. War Colonel. Captain Joseph's parents are believed to be John and Susannah Armstrong of Ireland. John's parents are believed to be John Armstrong and Ellen Curry. 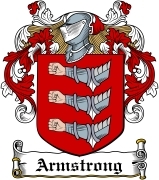 The ARMSTRONG legacy is one of wars and battles in Ireland, Scotland and England as well as in America. "Among Col. John Armstrong’s 300 frontiersmen who made the daring rescue at Kittanning was a company headed by Captain Joseph Armstrong, Sr. (In 1756, two McCords were in Captain Armstrong’s company, William and John McCord) For the daring rescue, Colonel John Armstrong and his officers received medals and monetary awards from the Penn family." SOURCES: Chester County Pennsylvania Wills, Armstrong Ancestry of the Jansen Daughters by Virginia Carpenter Jansen and George Jansen Jr.